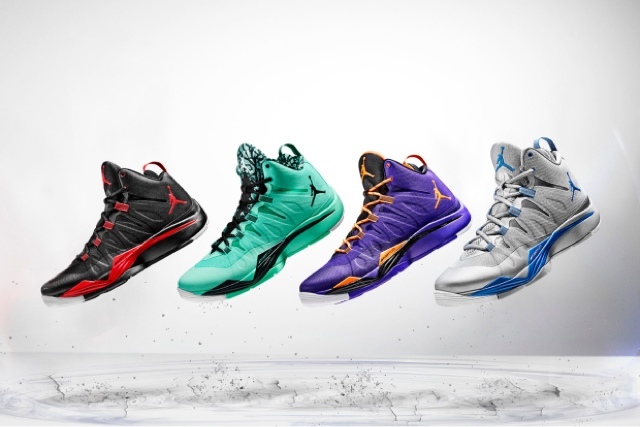 Jordan Brand took to Beijing’s Jordan Take Flight event this week to unveil its latest evolution in lightweight basketball footwear: the Jordan Super.Fly 2. Wear-tested by Los Angeles Clippers star Blake Griffin and specifically crafted for his high-flying style of play, the Super.Fly 2 is the third piece of Jordan footwear (following the Air Jordan XX8 and Jordan Trunner Dominate Pro) to incorporate the brand’s Flight Plate – a Pebax plate that maximizes the responsiveness of the Zoom Air cushioning by redirecting and redistributing the energy that the foot exerts on the ground, thus providing explosive lift-off when, in this case, taking the ball to the rim. Sporting an upper of lightweight/breathable/durable Hyperfuse, the design incorporates Dynamic Fit technology inspired by that of the Air Jordan XX8 while designer Justin Taylor also created a brand new modified herringbone pattern for the outsole – thus aiding in traction on the court. Look for Griffin to hit the hardwood in the Super.Fly 2 for the upcoming 2013-2014 NBA season following a release at Jordan Brand retailers on August 1.